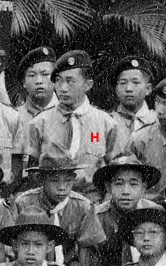 ?, Tang Kam-yan, Choy Shing-pang, Raymond Tang Kam-hing, ? 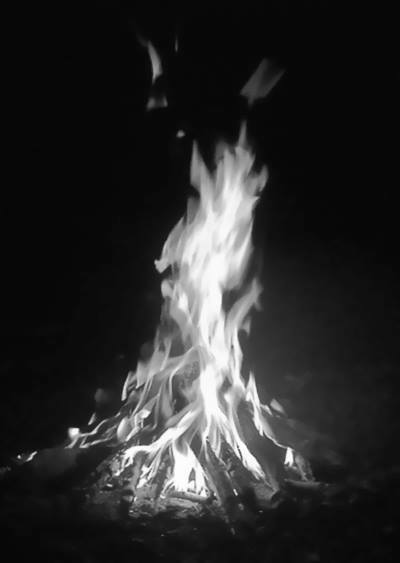 The night was getting chilly, and the Campfire had long finished. At 2am I went out to do a camp inspection, making sure the tent ropes are tight, equipment properly stowed etc. There in the dead of night, I heard giggling and suppressed laughter, still. From the Air Scouts area. 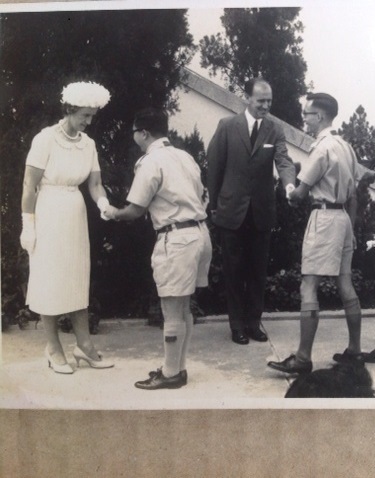 There were 7 of us that went up at the St George’s Day Rally that year, the largest contingent of Queen’s Scouts from one single Group. It was also a resounding come-back after a 5 year drought for 11th Kln. Not until X’mas Group camp late ’65 were the seven of us able to gather around, and over strong tea after campfire finally managed to have a sit-down chat. Only then did we realize that most of us have completed the requirements and waiting for district & HQ processing, the rest were a hair from it. 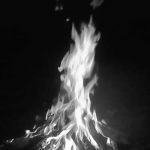 That night, the realization that the pursuit was at last over, and that we may well be making history, put us into a giddiness that kept us from falling asleep, tired as we were. 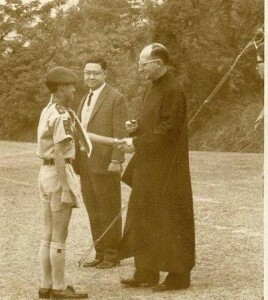 On April 24, George Law (DC Yaumatei, himself a 11th QS) visited us on the field and said 4 words “Well done, thank you”, exact same words Father C said back in February. They probably didn’t know how much that meant to us boys. We checked each other for uniform correctness, and went over to the form-up. 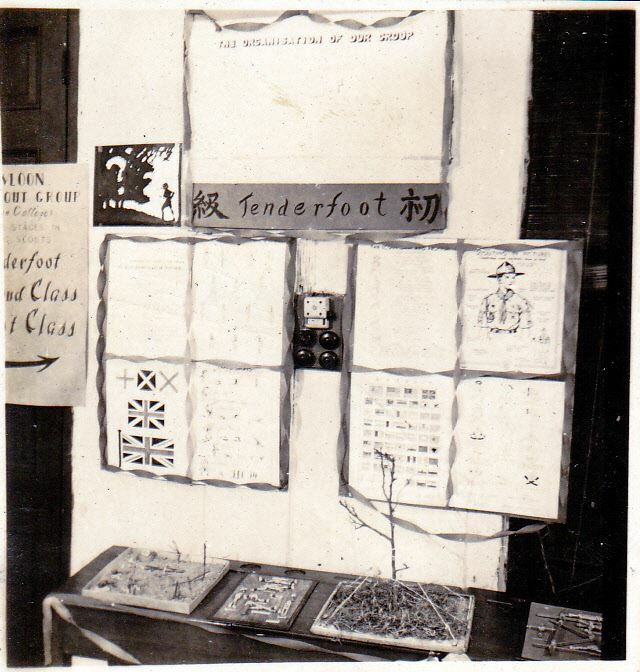 Sir David Trench actually went through all three ranks and handed out certificates to each. Salute, left hand shake, right hand receive…and just like that, 2 years+ of blood and sweat affirmed. Right turn, QSs forward, march off, and it was done. That was my first milestone. I was barely 17. Fr Cunningham was standing by the Group Colour, waiting for us to return. 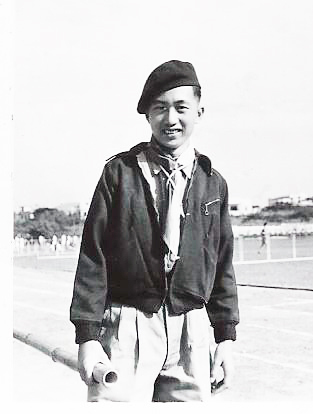 I remembered side-glancing smilingly at 大享, took a breath, with chests up, we marched purposefully up to the White & Blue, overwhelmed by feelings of elation, pride and satisfaction. With that memory still intact, exactly fifty years have elapsed. 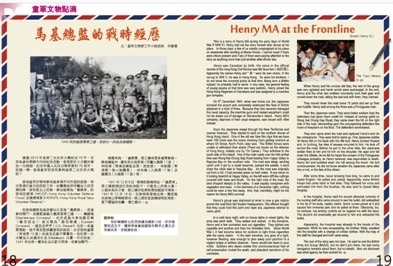 Henry, Kenneth, 柴記, 儍妹, S³, I hope you’re all still well. This piece of green & gold taught me to stay focused, to look beyond the bends what possibilities may exist, reminded me time and again the resilience I can muster, and fortified me for the many ups and downs over the 50 year journey. I remembered and kept the first promise I ever made on my honour, and stayed the course. Now in the autumn of my years, I came to realize what a profound influence it did cast, and what it is amongst a brotherhood I am privileged to be counted. My dear friends, go forth, I hope you have as rewarding a journey in the years ahead. 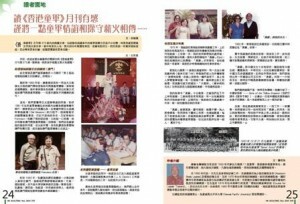 Please click the image to read the article forwarded by Klaus Chung. 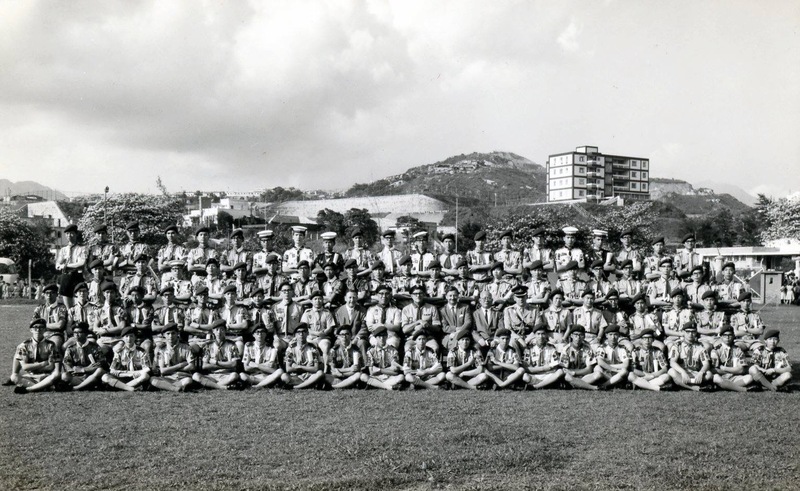 Four columns, 3 to a rank, in close formation, Gray uniforms a hundred strong……it was the largest contingent of 11th Kln scouts ever to march out of 56 Waterloo Rd. Four Troops, the strongest we have ever been, marching smartly through the streets of Causeway Bay, on their way to SoQuanPo Stadium for the annual celebration of the Feast of Christ the King. The Seniors on point, in full strength that day, more than half have QS on their sleeves, and even more Bushman’s Thongs on the rest of their shoulders. In another year, all those that were there marching that day would be a QS too. They were the pride of our Group, the resurgence of confidence and esprit de corp. The two Junior Troops, the core strength of us, representing the hope of our future years. No slouch these boys – having won 5 banners and trophies in Competitions colony-wide among them thus far in ’67. 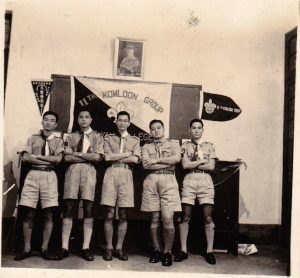 Bringing up the rear, the newly formed Air Scouts with their gray berets and gold insignia, the first Air Scout Troop in Hong Kong, and the first time their unique uniforms were shown to the public and other Scout Groups. Up Caroline Hill Rd, as we turned the last bend, the stands of the stadium came into view. Headed into the wind, the Colour bearer let loose the silk, and the White & Blue, golden tassels streaming, unfurled. Even the last rank of the formation could see the Group Colour snapping in the breeze on point up ahead, and felt the power of the columns of Gray marching in cadence. 200 meters to the gate across the road, we paused, and heard the thundering of a hundred pair of feet marking time on the pavement, and felt the tremour. And then we surged ahead, a flying wedge, led by the White & Blue into the stadium. The 11th Kln fielded the largest contingent that day, half the length of the football field honour guarded by a long line of Gray, proudly in support of ‘Ad majorem Dei Gloriam’. I was there, together with the hundred in 11th Gray, and just like them, full of pride and confidence. 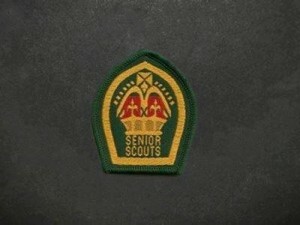 And out of this line of Gray, within 5 years, until the uniform changed, 32 Queen’s Scouts were to emerge. 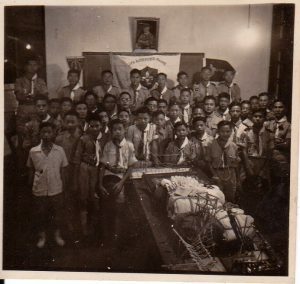 I remember that to this day, some 47 years ago……MY 11th Kln Group, still mine’s. Our White & Blue, long may it stand proud and strong. To those Fathers who came away from Ireland and ended up at 56 Waterloo Rd, we honour and remember you.